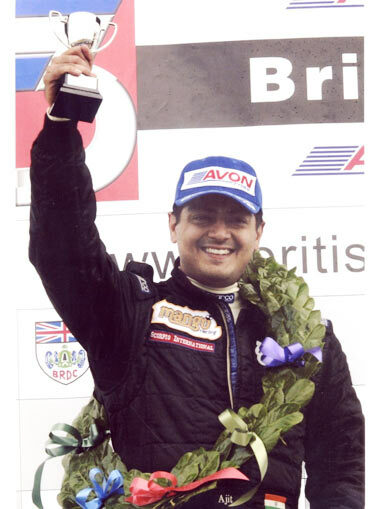 Ajith Kumar, the Tamil star with a huge fan following is all set to return to the racing circuit again. Ajith was a bike racer before he took up acting. 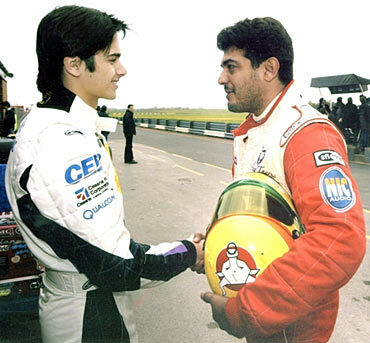 After he became a star in Tamil cinema, he returned to the tracks in 2000 and again in 2004, where he ended the season with two podium finishes. 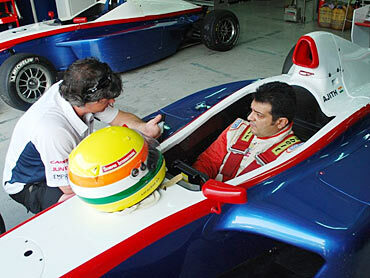 This time around Ajith is racing in the Formula 2 event in Europe in April. Ajith spoke exclusively to rediff.com about his passion. When I first met you in the early 90s, you were just recuperating from a bike accident. Do you think you would have become a bike racer and not a film star if not for the accident? I don't believe in post-mortems. I am where I am. Let us say I believe in destiny. I also believe in miracles. In early 2000, you decided to be a racer again though you were successful as an actor. Was it because motor racing is your passion? I love motor sports. Whenever I got an opportunity, I indulged. I would say I like to be an ambassador of the sport. 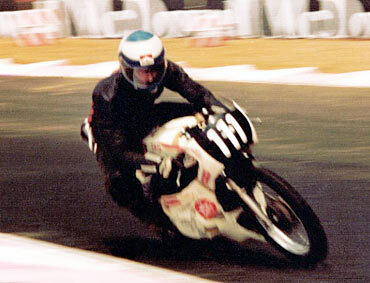 In the 1990s, I rode the 110 cc bikes. In 2002, I started racing cars. I did the National Championship and my best finish was the fourth place in the last race. That kind of motivated me to go further and I participated in the Formula BMW Asia championship. In 2004, I participated in the British F3. I could not complete my last few races there about which I wouldn't like to go into. It was a dream come true for anyone who loves motor sports. It was a proud moment for me to be with some of the best drivers in the world. I am eternally grateful. In 2002, when we spoke, you admitted that you were at a disadvantage as far as age was concerned. Today, you see Michael Schumacher, seven-time world champion coming back to racing after retiring at the age of 42. I think it is all about mental and physical fitness and how you feel. Now, you are going to Europe to participate in the European F2 championship starting this April. Do you think you would be able to manage both acting and racing? I plan to dedicate a lot of my time this year to racing. Let me make one thing clear; I am not looking at Formula 1 at all. A lot of people think racing is a hobby but it is another career option for me. I will continue to race F2 as long as I can. I am not for single seater racing alone; I would like to race on single seater as long as I can. After that, I am looking at many other options that are there all over the world like the GP2 Series. There are people racing at 60 plus in different parts of the world. So, from March-September this year, it is Formula 2 for me in Europe. In the meantime, producers Cloud Nine will be working on my 50th film with Gautham Menon. When I talked to Karun Chandhok [who is going to race F1 this year] he said the toughest part for every racer is getting sponsors. Is it different for you as you are a film star? It is the same for everyone. Still, this year, we may have Narain Karthikeyan and Karun Chandhok racing F1 and F2. Parthiv, Arman and I will also participate. I am glad that I am getting a lot of advice from Narain, Akbar Ibrahim, Karun and others this year. Arman, Parthiv and I plan to be together for F2. We are going to be sharing a lot of data and I am going to be taking a lot of information and help from them. Arman and Parthiv are teenagers. How do you feel to have them as company? All I can say is that I am very young at heart. On what criteria are the racers selected? They are based on past records and budget. In F2, insurance included, you will need about three and a half crore rupees for one season. It is six to six-and-a-half for GP2. Do you plan to race GP2 next year? How excited are you now about the races? More than excitement, I am kicked about training really hard. It is a lot of hard work. I have just started my training. Eurasia Motor Sport Management manages drivers -- they take care of all the drivers, logistics and coaching so that drivers can concentrate on racing. I am looking forward to that. I am determined to make a mark. Where have you been taking the coaching? I am leaving for Malaysia to take coaching and testing Renault V6. In the second week of March, I will leave for Europe. I will be based in London from March to September. In between the races, I will come to Chennai. Would you enjoy the anonymity there? I don't know whether I will have the time to enjoy it. I will have a lot of work to do. We have to read a lot of data and do a lot of training. I am working out for six hours everyday. I am determined to lose 20 kilos in a month. I have already lost three kilos in four days. I am jogging almost 15 kilometres everyday. I am working out on strengthening my neck muscles too. In the coming days, you will see a different Ajith. Is the film industry supportive? Yes, those who care for me are very supportive. How is your wife reacting to your decision to be a racer again? Recently I participated in the National MRF F 1600. It happened over dinner with Narain. He helped me make that decision. Then, I participated in the MRF race, and my wife had come along. She said, after a long time, I saw you smile and you looked very happy. When I said I would like to race, she said, go ahead and do it. She was the one who asked me to follow my heart. I owe it to my wife. If not for her, I wouldn't be racing. I have the support of my parents too. They know what racing means to me. If I don't do it now, I will never do it. I am also grateful to Narain for saying wonderful things about me on the radio. So, it won't be once in six years hereafter? No. I want to make a career of it. I am not talking about Formula 1. If my celebrity status can bring in more people to the sport, I will be very proud. I can do two or three films a year and make a lot of money. It is not my agenda. I want to do something for the sport I really love.